At one time the idea of watching movies on a Mac seemed both quaint and inconvenient. After all, you already had a TV and its accouterments in the rumpus room. Why gather friends and family around the desk in the corner of the living room to watch movies on a 17-inch iMac? But times are changing. A home media center that includes a Mac mini is no longer a crazy idea. Nor would anyone look askance if you moved your 27-inch iMac into that same rumpus room and devoted some of its time to entertainment. Once you accept the notion of a Mac as a home media player, your next thoughts naturally turn to movies and, likely, the iTunes Store. But the Store isn’t the end-all-and-be all of online movie sources. Although outfits such as CinemaNow and Blockbuster demand that their content be watched on devices that don’t bear the Apple brand, there are a handful of other sources for movies that you can play on your Mac. Step up to the ticket booth and check out these options. We can hardly begin without mentioning what the iTunes Store provides. Of any source, the iTunes Store is the most Mac friendly. Offering thousands of movies for purchase or rental, the Store’s movies are playable on a Mac, Windows PC, Apple TV, iPod, and iPhone. You can transfer them to and play them on any computer authorized with the Apple ID used to purchase or rent the movie. The Store sells and rents both standard definition and HD movies. There are currently more than 280 HD movies, available in the 720p (1280 by 720) format. Many feature 5.1 surround-sound soundtracks as well. Apple's prices are based on a movie's age and format. 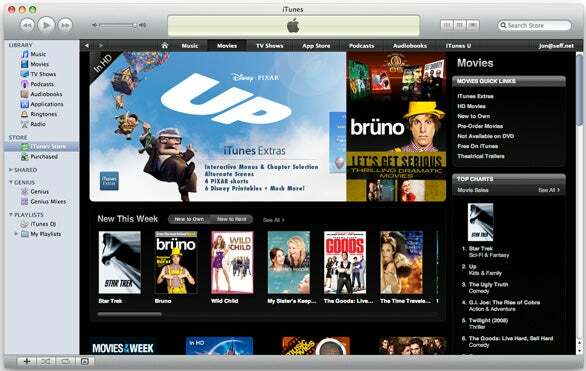 Apple characterizes movies as being library (meaning older) or new. Prices generally shake out as follow: standard-definition library titles cost $10 to purchase; new standard-definition titles are $15; all HD titles cost $20; iTunes Extras movies, which contain bonus DVD-like material, cost $15 in SD format or $20 in HD (there are some exceptions to iTunes Extras pricing, however). As for rentals, standard-definition library titles cost $3, and new library titles in standard definition cost $4. Library HD rentals cost $4, and new HD rentals cost $5 (iTunes Extras content is not available for rentals). After you download a rental movie, you have 30 days to watch it. After you start watching it, you have 24 hours to finish it; the movie is automatically removed from you Mac after that period. During those 24 hours, you can watch the movie as many times as you like. Like all videos sold at the Store, you can't burn movies in a form playable on a DVD player. You can, however, burn purchased movies as data for backup purposes. Amazon’s Video On Demand service is one of the few movie services other than the iTunes Store that’s not actively hostile to the Mac. It can afford to be magnanimous because it streams movies via a Web browser, even one that sits on your Mac. You can also watch the service’s movies on TiVo, Roku players, compatible Sony Bravia devices, Panasonic TVs that support Viera Cast, and compatible Samsung HDTVs. You’re allowed to download videos to up to two compatible devices—a TiVo and Windows PC, for example. Regrettably a Mac isn’t one of those compatible devices. Clearly, Amazon Video On Demand is not the ideal service for Mac users, but it does offer a couple of advantages over the iTunes Store. For one, if you purchase a movie it's accessible to stream on any Internet-connected computer, so can watch it on your laptop while visiting the in-laws without having to remember to copy it to that Mac's hard drive. Another—particularly if you're willing to broaden your video diet to include TV shows—is price. Amazon, like the iTunes Store, sells individual TV episodes for $2 (SD) and $3 (HD). But purchase a season and you’ll save money at Amazon. For example, the first season of Mad Men costs $20 (SD) and $35 at the iTunes Store. Amazon charges $18 (SD) and $28 (HD). Dexter Season 2 at the Store is $24 (SD) and $36 (HD). The same season costs $19 (SD) and $29 (HD) at Amazon. 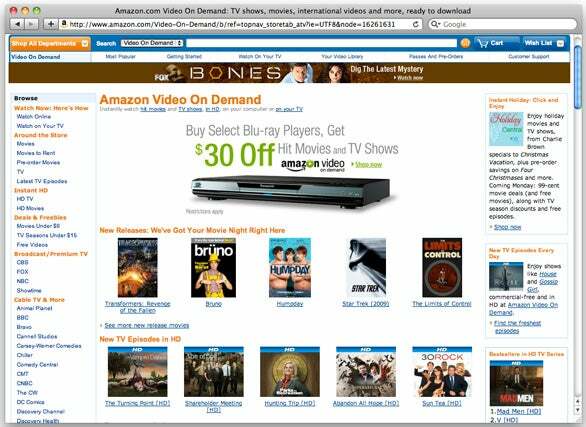 Even if you're interested in movies only, Amazon also offers deals on current movie rentals. For example, recently you could rent Orphan for $2. The Store’s rental price that day was $4. One could very reasonably argue that the iTunes Store provides more value—you actually have the content on your hard drive rather than in the cloud, and you can play them on an iPod, iPhone, and Apple TV. But if your intention is to watch the video only on a TV connected to a computer or on the Mac's screen itself, Amazon could be the better deal, provided that you have fast and reliable broadband. (To stream HD content you should have a broadband connection of 5mbps or better.) Also, those Amazon videos are available to you wherever you have a computer and fast Internet connection. The-DVD-in-the-mailbox company, Netflix, has offered movie streaming for a couple of years through its Watch Instantly feature. If you have a Netflix plan starting at $9 (one DVD at a time) you're welcome to use this service, which offers more than 20,000 movies and TV episodes. On a Mac you’d normally watch Netflix streams via a Web browser. However, both the Boxee and Plex media center applications allow you to watch Netflix Watch Instantly content. Or, if you’d like to use Apple’s media center application, Front Row, you can install the open-source Understudy, which adds both Netflix Watch Instantly and Hulu Desktop to Front Row. The visual quality of Netflix's content doesn't match that of either the iTunes Store or Amazon Video On Demand—both of which look quite good. The faster your Internet connection, the better the picture. But even with a reasonably fast connection I’ve yet to see a stream that comes close to the look of a DVD (or iTunes or Amazon content), much less HD. But it’s hard to beat the price, particularly if you’re already a Netflix subscriber. Of course YouTube has movies… no, real movies. Okay, some are real old movies, but movies nonetheless. And they're free. 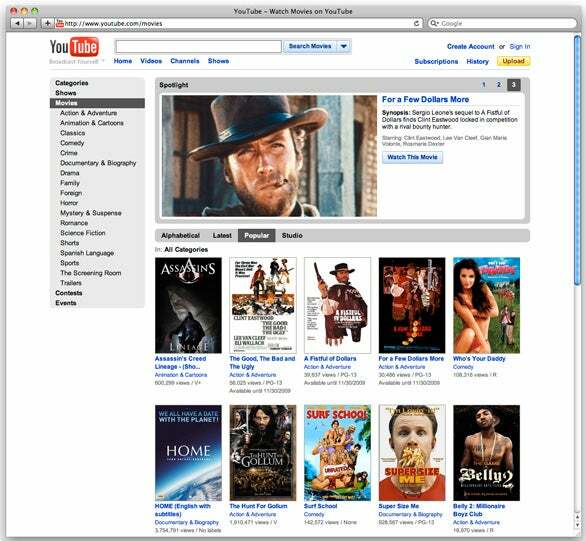 If you’ve been wanting to catch up on your spaghetti westerns or B-movie drive-in fare (and a few gems thrown in for good measure), point your browser at YouTube’s Movies channel. And keep YouTube bookmarked. Reports are that YouTube is talking to major movie studios about offering movies for rent. As mentioned earlier, Boxee is a media center application rather than a source for videos. However, it includes a couple of plug-ins that can lead you to movies scattered across the Web. For example, install the Internet Archive plug-in and you can view a vast number of old films (including silent films) that are now in the public domain. The Public Torrents plug-in allows you to download this same kind of content and view it within Boxee. All content available through Boxee is free. A popular destination for watching TV episodes and clips, Hulu also offers full-length movies. Similar to YouTube’s movies, the films available from Hulu aren’t recent blockbusters or Oscar-winning fare, but you’re sure to find a handful of movies to kill an evening. Like Hulu’s TV shows, these movies are free and include the occasional short advertisement. You’re welcome to watch Hulu from within a Web browser, but Hulu Desktop, Boxee, or Plex provide the better viewing experience. Of the three avenues, Hulu Desktop is the most reliable because, unlike with Boxee and Plex, the people running Hulu actually want it to work. Hulu has taken pains in the past to break other applications’ access to the service. It wasn't long ago that video-on-demand was a pipe dream. Yet, almost without realizing it, that dream has become reality thanks to faster broadband and the increasing number of gadgets that can take advantage of it. With these resources at your disposal, your Mac becomes an important—if not primary—component of that dream.